The new suits from Spider-Man: Far from Home are on display at Brazil Comic-Con, aka CCXP. The black and red suit as well as the black stealth suit have been photographed up close and they look awesome. The red and black suit was featured in set photos right before production wrapped in New York City and then was shown again in an official capacity when Tom Holland wore the suit for a bit on Jimmy Kimmel Live! where his sidekick Guillermo stole the mask from Holland. Over the summer, fans were treated to leaked set photos from all over Europe that featured Tom Holland in different suits. The black and red one looks pretty awesome, but it looks pretty similar to the regular Spider-Man: Far From Home suit. However, it's the black stealth suit that looks really cool up close. We've seen teases in leaked set photos, but this gives an excellent look at the goggles as well as blank patch on the chest area. 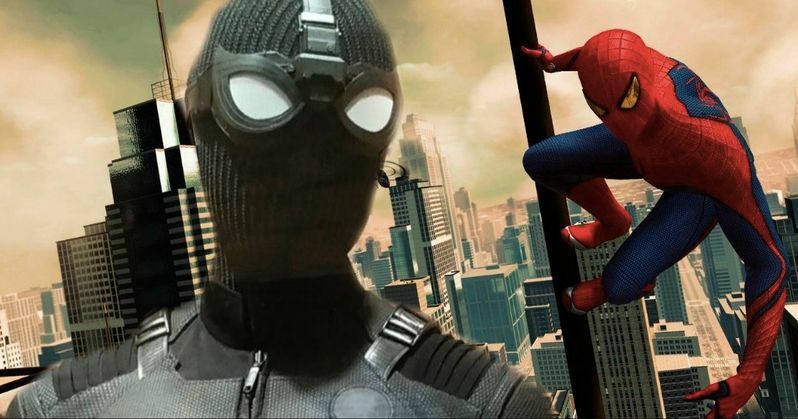 It has been rumored that the stealth suit was gifted to Peter Parker by Nick Fury and that the real patch in the movie will have a S.H.I.E.L.D. logo on it. Samuel L. Jackson was spotted more than once on the set of Spider-Man: Far From Home, and many are wondering how Nick Fury and Peter Parker are going to link up after the events of Infinity War. Both characters famously turned to dust at the end of the movie and Marvel Cinematic Universe fans are wondering how they'll make it back from the dust bin to further tell their stories. Thankfully, the Avengers 4 trailer is expected to drop sometime this week, though that has yet to be confirmed at this time, and it may shed some light on a possible return of our heroes. With the Avengers 4 trailer on the way, and the CCXP Spider-Man: Far From Home suits on display, speculation has sparked that the trailer for the Spider-Man sequel will be released this weekend as well. There were rumors before the week started that it was going to be huge for MCU fans, but that might prove to be too intense. With that being said, lucky attendees at CCXP may get treated to a teaser or even a sizzle reel that will be exclusive to the convention. Spider-Man: Far From Home, Avengers 4, and Captain Marvel all hit theaters within months of each other, so many are wondering how they are going to go about promoting them. For one, it's believed that Peter Parker is no longer with us, so it might be weird to see some promotional material with him in it after an Avengers 4 trailer, which will more than likely not feature Peter Parker at all, or any of the rest of the dusted heroes. However, Marvel Studios could release a teaser that does not feature Parker, which could tease out some more mystery. Thankfully we'll find out some time this weekend about the rest of the trailers. You can check out the awesome new looks at the Spider-Man: Far From Home suits below, thanks to Omelette.